Black Nerites are Some of the most numerous and easily identified shells of our rocky shores. 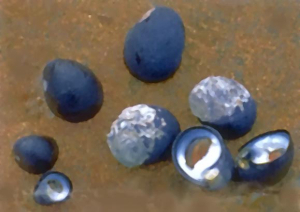 These snails, a glistening black when wet, are usually found in crevices, rock Pools or under rocks during low tide except when the weather is cool or raining. When the tide rises to cover them, they move around the shore to feed, leaving ‘snail trails’.